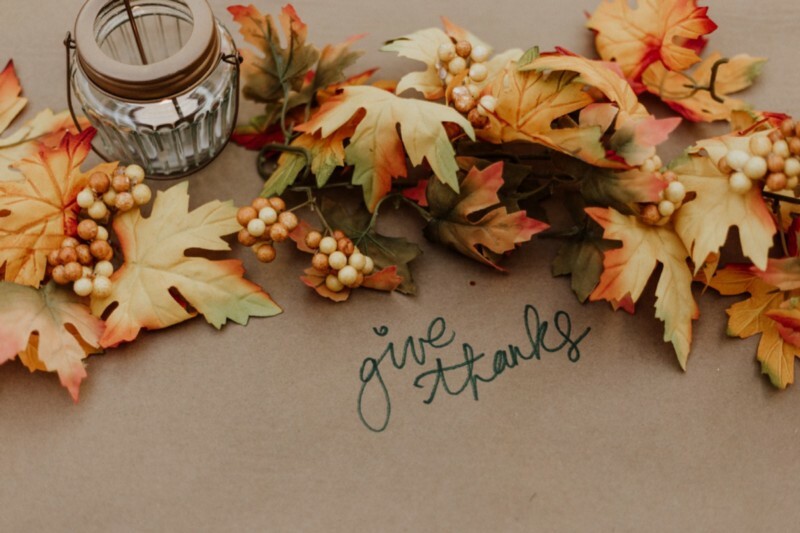 Even if all you do is sit around and eat all day, (and we do recommend turkey, and dark chocolate,) the giving thanks part of Thanksgiving is actually powerful exercise… for your brain. Today we take a look at the neuroscience of this powerful phenomenon. This time of year, between Thanksgiving and New Year, is for many people a time of increased stress, depression and anxiety. In fact, a survey by the American Psychological Association (APA) found that 44 percent of women and 31 percent of men report an increase in stress around the holidays. Yet Thanksgiving’s eponymous activity — giving thanks — arms us with a strong weapon to ward off this stress and negative emotion. Studies show that expressing gratitude literally exercises the areas of the brain responsible for emotional control. Better emotional control means less stress. Less stress means a happier holiday season. For this reason, we encourage you to grab on to the momentum given to us all this holiday, and keep it going through 2019. A daily practice of gratitude from now through New Year is a strong move towards getting your peak brain and protecting yourself from the holiday blues. Let’s look more deeply at how it works. In positive psychology research, gratitude is strongly and consistently associated with greater happiness. Gratitude helps people feel more positive emotions, relish good experiences, improve their health, deal with adversity, and build strong relationships. These are valuable conclusions. But neuroscientists like us want to know why. What is happening inside the brain that is responsible for this? While the neuroscientific research on gratitude is still quite young, several important studies do provide fascinating insight. In their paper, “Decomposing Gratitude: Representation and Integration of…Gratitude in the Brain,” (published just this May in the Journal of Neuroscience,) researchers used fMRI*-based evidence to pinpoint the neurocognitive processes associated with this phenomenon. *Functional magnetic resonance imaging, or fMRI, is a technology that measures brain activity by measuring associated blood flow. 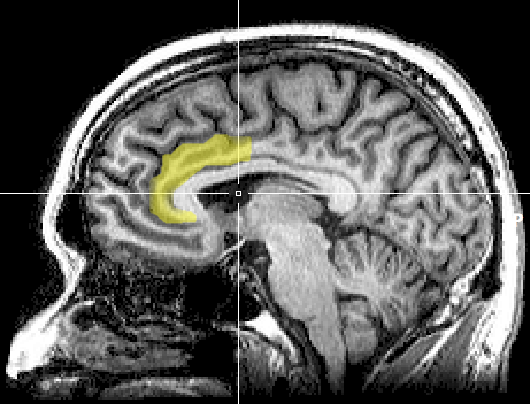 Shown here, the anterior cingulate cortex, or ACC. 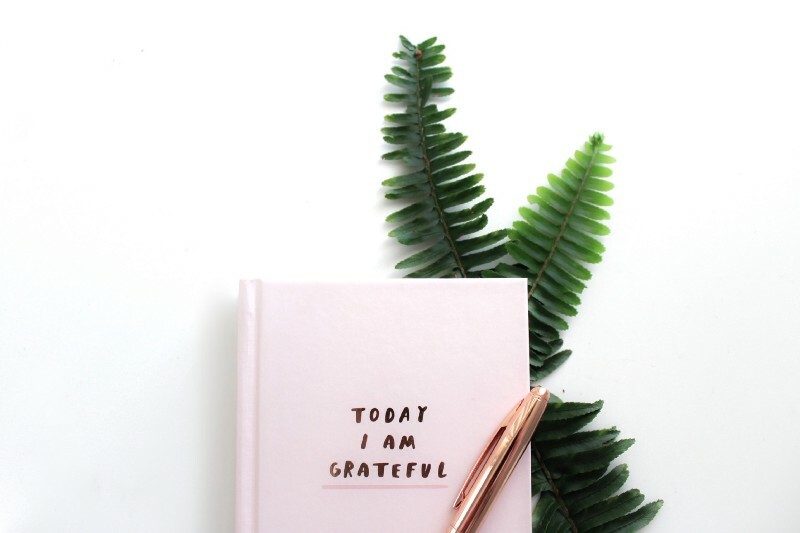 The researchers found that the intensity of someone’s gratitude correlated with varying degrees of activation of a part of the brain called the perigenual anterior cingulate cortex (pgACC), a subarea of the anterior cingulate cortex (ACC). In short, the stronger your feelings of gratitude, the stronger the blood flow and neuronal activation in this area. So what’s up with the ACC? As this information comes together — the functions of the ACC, and how gratitude activates it — the picture begins to emerge of how giving thanks is indeed a way to physically exercise the part of your brain that helps you control your emotional state. Turns out there’s some real science behind the notion that expressing gratitude makes you happier. Previous fMRI research also connected gratitude with brain activity in the ACC, while additionally indicating another region of the brain: the medial prefrontal cortex (mPFC). Indeed, the meaning we prescribe to an object or event — and the emotions we feel in connection with that meaning — come from our brains. Again allowing the bigger picture to emerge from all this information, this science suggests that by practicing gratitude we not only build emotional resilience, we also empower ourselves within the meaning-making process of how we understand the story of our lives. Through gratitude we can score significance to the events of our lives in a way that helps us truly enjoy them more in the present and store them as positive memories for the future. Make a Commitment. Make It a Practice. Thanksgiving gives us the opportunity to reflect on our lot in life, identify the good within, and express our gratitude. In this activity, we exercise our brains. But as with any other type of exercise, brain exercise and mental-fitness training, (our expertise here at Peak Brain Institute,) require regular practice in order to yield real and sustainable benefit. One 2016 study examined the effects of a 3-week writing intervention on 293 individuals with issues related to depression and anxiety. The participants who wrote daily letters of gratitude reported significantly better mental health when re-assessed both 4-months and 12-months later. These self-reports were validated with fMRI assessments as well. Most interestingly… the gratitude letter writers showed greater activation in the [MPFC] when they experienced gratitude in the fMRI scanner. This is striking as this effect was found three months after the letter writing began. This indicates that simply expressing gratitude may have lasting effects on the brain. While not conclusive, this finding suggests that practicing gratitude may help train the brain to be more sensitive to the experience of gratitude… and this could contribute to improved mental health over time. New Year’s Day is typically the day for making “resolutions” — the commitments you make to yourself for your own self-improvement . But why not take advantage of the opportunity to follow today’s momentum with expressing gratitude? Starting today, take a few minutes each day to write down the things you are grateful for. It’s one of the simplest exercises you can do to get your peak brain! Don’t let the holiday season bring you down. Let it build you up. Thanks to Thanksgiving, you’ve already begun. All that’s left to do now is keep going. For more information on how you can build lasting brain changes and get your peak brain, we’re here.